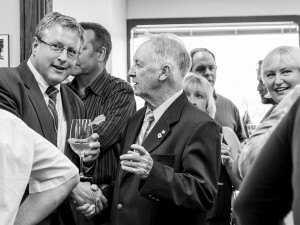 In May, 2013, EastPoint Engineering officially ‘unveiled’ their refreshed logo and website at their 10th Anniversary Cocktail Reception. The gathering brought together EastPoint’s staff and business partners to celebrate past and present projects in the region and talk about business opportunities on the horizon. Pictured at the event are Aubrey Palmeter and Skit Ferguson, Executive Director of Consulting Engineers of Nova Scotia, who for almost 20 years has supported and guided the volunteer leadership of the Consulting Engineers of Nova Scotia.